Students posing with Bamboo products on the conclusion of ‘Bamboo Design Workshop’ at SMvDU Katra. 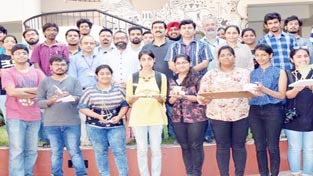 REASI, Oct 2: Four-day workshop on ‘Bamboo Design possibilities in Architecture and Design’ concluded at Shri Mata Vaishno Devi University (SMVDU), Katra. This workshop was organized by Department of Architecture & Landscape Design, Shri Mata Vaishno Devi University (SMVDU), Katra in collaboration with National Institute of Design (NID)-Ahmedabad. Prof Pravinsinh Solanki (Coordinator-centre of Bamboo Initiatives at NID Ahmedabad) was invited as the resource person for the workshop. Through the workshop, Prof Solanki gave a detailed insight into the use of Bamboo in design in addition to laying impetus on use of such sustainable materials in present design era. The workshop was organized through intelligent inputs from Prof Solanki over the span of four days and most of the contents of the workshop were targeted upon 2-way teaching and learning. Prof Solanki also showcased his students work at NID along with his own works carried out in India and abroad using Bamboo. Day three presentation from Prof Solanki was focused upon the ‘Contemporary Designs Using Bamboo’, and highlighted various interior products like wardrobe hangers using bamboo. The workshop was primarily focused on the training of students of Architecture-SMVDU with the art of using Bamboo. Pertinent to mention that this 4-day workshop was the first module of the 2-module workshop as such various designs were developed by the students under the guidance of Prof Solanki and departmental faculty for possible fabrication during the module-2 (hands on training of using Bamboo) of the workshop scheduled in December. In the concluding remarks, Prof Solanki emphasized the importance of such workshops and collaboration of reputed institutes of learning for wider learning required in today’s competitive world. Owing to his vast International experience of design, he further suggested various niche areas of collaborative learning at national and international platforms.